In many faith traditions, the promotion of social justice values is paramount. 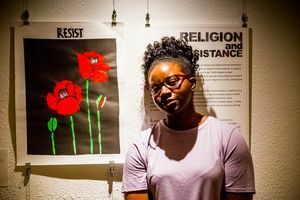 Activists who are inspired by the teachings of their faith often include religious references on protest signs and posters, as well as in performances. These religious allusions constitute markers to faith communities, calling all members to the cause. Religious references may also serve to ground the protest in ancient history and culture, linking a contemporary resistance movement with a well established, and possibly sacred, social value.